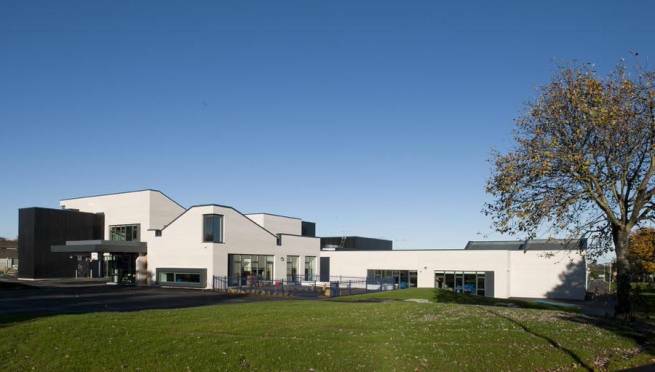 Ogilvie Construction were selected by Hub North Scotland Ltd, acting on behalf of Aberdeen City Council, as Main Contractor for the construction of the new “state of the art” Brimmond School. The contracted works consisted of the provision and removal of decant accommodation, the demolition of an existing school building and the erection of the new school building. The new Primary School caters for 420 primary pupils, 80 nursery places and accommodation for visual support services. The GIFA of 4500m² provides 12 class places in the lower, middle and upper school hubs with associated activity spaces, break out areas, cloakrooms, welfare facilities, staff areas, library, assembly, dinning, kitchen areas along with GP rooms, Additional Support Needs and Visual Support Services accommodation. External teaching spaces, play areas and MUGA completed this first class teaching facility. The Project Delivery Team contributed in design development from RIBA Stage B advising on buildability, construction interfaces, build sequencing and value engineering cost options ensuring design was developed to achieve best value for the Client. Sustainability KPIs were put in place to reduce and monitor the recycling of our materials, fuel usage and the use of sustainable materials and segregated skips were utilised to recycle as much materials as possible; all timber utilised on site as FSC Certified. Registered with Considerate Constructors, we successfully delivered the project as “Beyond Compliance". Contact us if you wish to learn more about this or any of our other construction projects. Client: Hub North Scotland Ltd.